Preparing Thanksgiving dinner should not be a dangerous undertaking. But in recent years, new hazards have emerged because more chefs have decided to deep-fry their turkey. For starters, a turkey is a large object to drop into a pot of boiling oil. Things can and do go wrong. For starters, you need a lot of oil to completely submerge a 30-pound turkey. The oil must be heated to at least 350 degrees Fahrenheit. That's a lot of oil heated to a very high temperature. Splashes and spills can cause fires and serious injury. If you are determined to cook a turkey this way, experts agree that children and pets should be kept far away from the deep-flying setup. Don't use your deep fryer until you've read the directions. It's also important to know whether you have an indoor fryer or an outdoor fryer. If it's an indoor appliance, never use it outdoors. If it's made for the outdoors, never use it indoors. If you are cooking outdoors, never leave your cooker unattended, even though it could take a couple of hours to cook the bird. Also, it is never a good idea to consume alcohol while deep frying a turkey. Firefighters produced the video below to demonstrate how dangerous it can be to deep fry a turkey if the oil spills out of the pot and comes in contact with the heating surface. 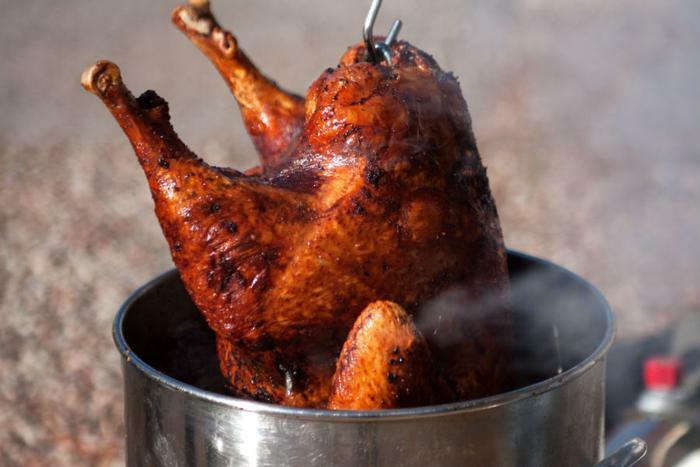 If deep-frying a turkey is so prone to hazards, why do people do it? Perhaps the reason is the fact that cooking a turkey in the oven can be an imprecise method. Frying the bird in a pot of boiling oil delivers a turkey that is almost always crispy on the outside and moist and juicy on the inside. Unfortunately, deep-frying mishaps aren't the only holiday cooking hazard. The National Fire Protection Association reports Thanksgiving is the peak day for home cooking fires, followed by Christmas Day, Christmas Eve, and the day before Thanksgiving. In 2016, U.S. fire departments responded to an estimated 1,570 home cooking fires on Thanksgiving. Unattended cooking was by far the leading contributing factor in cooking fires and fire deaths.